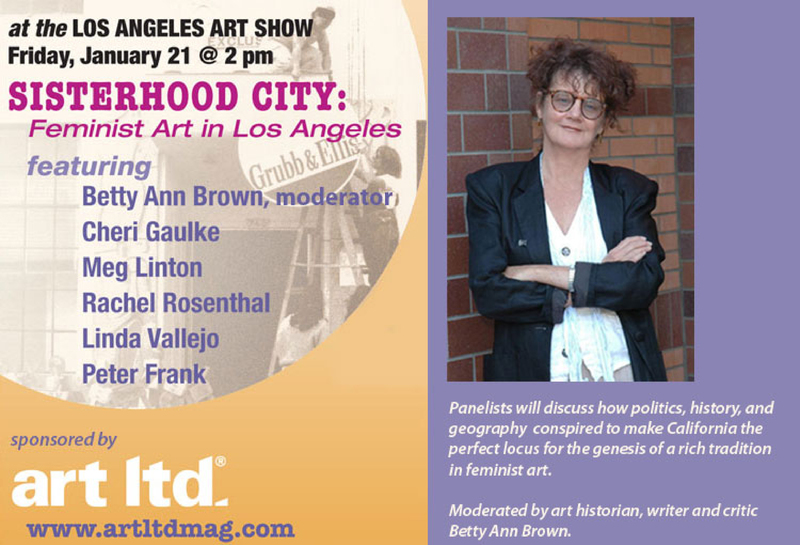 Friday, Jan. 21 at 2 pm I will be participating in a panel discussion at the LA Art Show. 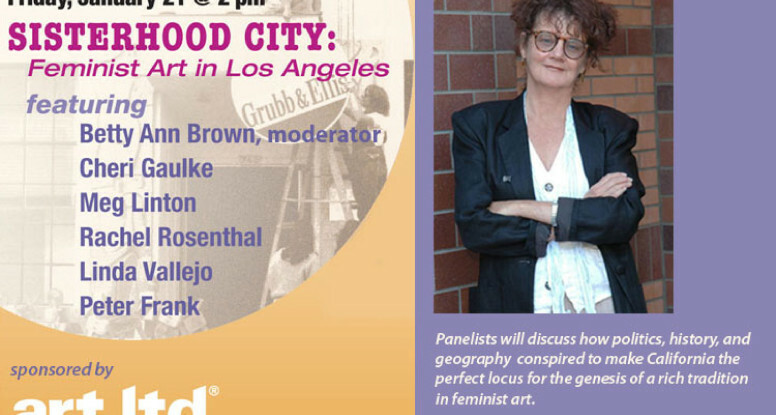 The panel, Sisterhood City: Feminist Art in Los Angeles, is moderated by art historian, critic and writer Betty Ann Brown, and includes Otis gallery director Meg Linton, critic Peter Frank, and artists Sandra Rowe, Linda Vallejo and myself (Rachel Rosenthal is unable to participate). Panelists will discuss how politics, history, and geography conspired to make California the perfect locus for the genesis of a rich tradition in feminist art. Come hear us, make comments of your own, and cruise through the L.A. Art Show while you’re there! It’s at the LA Convention Center and you can find more info about parking, admission and a list or art exhibitors at http://www.laartshow.com/. Cheri Gaulke’s art and life were profoundly changed in 1975, when she moved from the Midwest to Los Angeles to join the Feminist Studio Workshop at the Woman’s Building. She worked primarily in performance art from 1974-1992, addressing themes such as the body, religion, sexual identity, and the environment. In addition to her solo work, she co-founded collaborative performance groups Feminist Art Workers (1976-81) and Sisters Of Survival (1981-85). Gaulke’s art continues to be a vehicle for social commentary, and as a way to tell the stories of individuals and groups under-represented in society. Her public art includes a Metro station and a Filipino WWII Veterans Memorial; her artists’ books are in university and museum collections nationwide and her videos have been screened in film festivals internationally. As an educator, Gaulke has mentored hundreds of award-winning youth videos as Visual Arts Department Chair at Harvard-Westlake School, Director of Harvard-Westlake Summer Film, and Artistic Director of The Righteous Conversations Project.